Zootopia Review - Are You Screening? Disney films have taken a turn in recent years towards a new level of depth within the fun, and movies like Frozen and Big Hero 6 are shining examples. 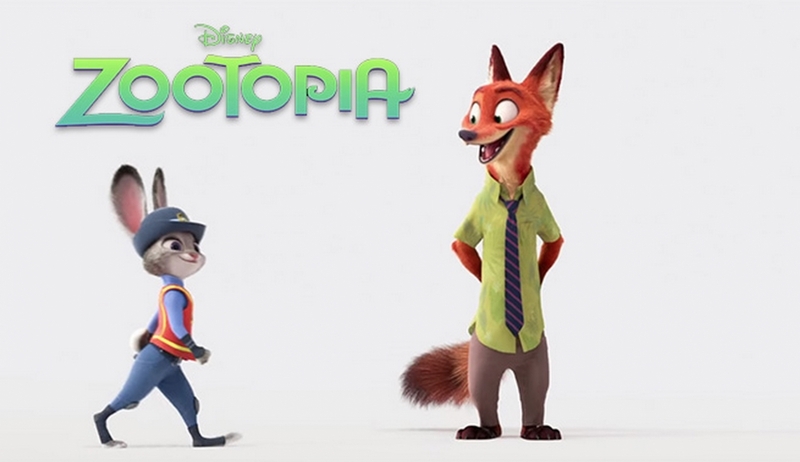 Zootopia not only continues that progress, it’s a move in a more daring direction. Judy Hopps (Ginnifer Goodwin) is a bunny with a dream, and the commentary on society begins with her own parents, who, with the best of intentions, try to talk her out of it. Judy hopes to be a cop one day, but in her universe of anthropomorphized animals, rabbits don’t become cops. Her brains win out, and she gets through the police academy, but her first day on the job serves to continue her education when Chief Bogo (Idris Elba) assigns her to traffic duty, and this despite the fact that there’s too much “real work” (this is not a traffic officer’s favorite film) to handle. Not to be disheartened, much as is the wont of cute bunnies (but, don’t call them cute to their face) Judy sets out to prove her abilities. She soon runs into Nick Wilde (Jason Bateman), a fox who tries to convince Judy that the first thing she ought to do is figure out that she’s a rabbit. As luck would have it, the pair find themselves at the heart of the investigation into a string of missing predators, which connects them to a string of related events which see certain predator individuals “going savage.” The investigation naturally has them meeting up with a variety of characters, all of whom may or may not have anything to do with the case, and may or may not be good for a gag or two. Where films like Frozen have heart in spades, and take on interesting themes, Zootopia has perspective, and it doesn’t sugarcoat its approach, despite pulling some fun into the adventure. There are big moments in what turns out to be a buddy-cop-esque narrative, but they are largely swallowed up in the more entertaining pieces of the film. The most interesting notes of the film are reserved for smaller, less-focused efforts, some that are never actually mentioned at all. There is no shortage of opinion thrown directly at Judy, and Nick starts out the film as worldview-weariness incarnate, but that’s a simpler story. Everyone’s wrong in this film, whether that’s just the way predators unthinkingly treat the prey around them, or Judy continues to carry her fox repellent spray. Here is a movie that has some things it’s characters are willing to say directly, but also puts out a background mindset, and then doubles down by mostly ignoring it. Best of all, while Zootopia built in several possible directions (just by the accident of creating a rich world), it’s Judy herself who causes the most civic destruction, not because she puts forward any view, but simply because she isn’t self-cognizant enough to realize she has adopted the view at all. None of this sounds like a movie that will become a child’s favorite, but it is. It’s all wrapped in a marvelous adventure, within a world of fun, witty, and sometimes silly characters. Judy is a brave and crafty heroine, and best of all delivers a stunningly real and heartfelt apology (which is cinematically rare to a degree that will surprise you if you think about it), and she deserves a place higher on the Disney totem pole than she’ll ever realize. She is also filled to bursting with small treasures that will not only surprise many younger viewers, but serve to kick off great internal conversations for them as well. Her joyous response to her new apartment is one of the better examples. I mentioned that Disney films have taken a turn recently, but it isn’t a new turn, it’s an old one. There was a dedication to children as the smartest people around inherent that everything Disney made at one time, and we’re getting back to it. Here, nothing about the film betrays any sensibility involved in its creation other than one that simply marvels at children. You could easily make a film that portrays the prejudices of the world slapped onto a world of animals, but this is not really that movie. It isn’t even a movie that thinks that actually describes a goal. This is a movie that hopes to eventually fail to make any sense as an actual portrayal of anything.